The Chiefs have been the league’s hottest team with a 2-0 start, but the Chargers have disappointed with two last-minute losses. Now the Chargers are down two games to everyone in the division and couldn’t even sell out its first ever Los Angeles game, and the season is on the line in a must-win division home game. What players will be the key? Smith is a top three fantasy QB so far, and the Chargers have allowed plenty of points to the passing game. Don’t expect four TDs like in Week 1 again, but Smith should be a decent spot start. The Kareem Hunt train kept right on rolling last week, and there’s no reason to believe it’ll stop Sunday. Hunt leads the league with five touchdowns, and the Chargers allowed more TDs to RBs than all but two teams a year ago. Hunt should be locked and loaded. Hill is always going to be a boom or bust option, heavily reliant on big plays to accumulate his point total for the week. This may be a down week against a pair of top Chargers corners. Hill had only 55 yards and six catches in two games against the Chargers last season. Kelce was a beast last week with eight catches for 103 yards and a TD, and he should be the top target again this week. He’s a weekly start and probably the one sure thing stud TE option in DFS leagues with everyone else banged up or struggling. Kansas City’s defense should be a good start again. The Chargers allowed the third most points to opposing fantasy defenses last season, though the Chiefs had only a sack and two turnovers in the two games last season. They’re always a threat to take a kick to the house. The Chargers may have struggled to an 0-2 start, but it’s not Rivers’s fault. He’s been on the mark and is fifth in the league in passing touchdowns, and the Chiefs are top seven in points allowed to fantasy QBs so far this year and just allowed a huge game to Carson Wentz. Rivers could be next. Gordon continues to produce fantasy points with smoke and mirrors, never doing much per carry but usually finding a way to make up ground catching passes and getting into the endzone. The Chiefs have allowed three rushing TDs in 2017, most of any team, so that could continue. 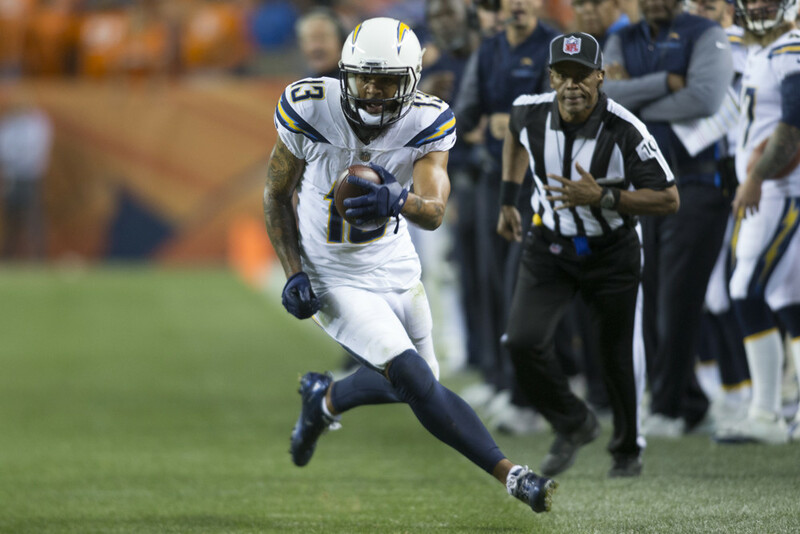 Keenan Allen is tied for second in the NFL with 14 receptions so far, and that includes a game against Denver’s top defense. He looks locked in as a WR1, especially in PPR leagues, and he’s a top play against a Chiefs defense that’s been lit up by opposing WRs thus far. Tyrell Williams has established himself as the clear WR2 for the Chargers in snaps and targets, but that still leaves him low on the totem pole behind the backs and tight ends. He’s a flex option. Henry and Gates split snaps evenly last week, though Henry caught seven passes and Gates got into the endzone. The Chiefs were top ten against TEs last year so this may be a good week to play another option until one of these two steps further forward.